Hoover Dam is a concrete gravity-arch dam in the Black Canyon of the Colorado River, on the border between Arizona and Nevada. 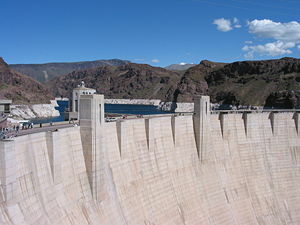 The dam, located 48 kilometers (30 miles) southeast of Las Vegas, is named after Herbert Hoover, who played an instrumental role in its construction. Hoover was an engineer who promoted the dam, first as Secretary of Commerce, and later as President of the United States. Construction began in 1931 and was completed in 1936, over two years ahead of schedule. The dam is operated by the Bureau of Reclamation of the U.S. Department of the Interior. The dam provided jobs for many depression-era workers and became an inspiration for Roosevelt's Civilian Conservation Corps (CCC) and other New Deal programs. The gigantic size of the project stimulated the invention of many machines, paving the way for future large construction projects. Lake Mead, the reservoir created behind the dam, is named after Elwood Mead who oversaw the construction of the dam. Listed on the National Register of Historic Places in 1981, Hoover Dam was designated a National Historic Landmark in 1985. 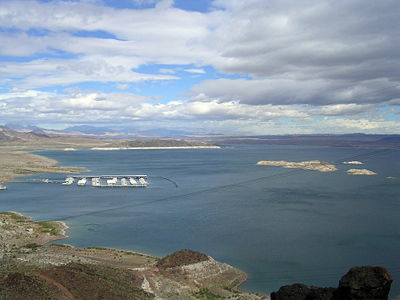 Lake Mead, formed by Hoover Dam, supplies the Southwest with water and serves as a recreational area. Before the construction of the dam, the Colorado River would periodically overflow its banks when snow from the Rocky Mountains melted and drained into the river causing floods that destroyed downstream farming communities. In 1905, floods cut a new channel for the river through inhabited farmland which took 16 months to reverse. Then the water would run off and evaporate before crops could ripen and be harvested. In addition to essential flood control, a dam would make possible the expansion of irrigated farming in the desert region. It would also provide a dependable supply of water for Los Angeles, Las Vegas, and other communities in southern California, Nevada, and Arizona, and could provide electrical power for over one million people. A commission was formed in 1922 with a representative from each of the Basin states and one from the federal government. The government's representative was Herbert Hoover, then Secretary of Commerce under President Warren Harding. In January 1922, Hoover met with the state governors of Arizona, California, Nevada, New Mexico, Utah, and Wyoming to work out an arrangement for apportioning the waters of the Colorado River for their states' use. The resulting Colorado River Compact, signed on November 24, 1922, split the river basin into upper and lower halves with the states within each region deciding how the water would be divided. This agreement, known as the Hoover Compromise, paved the way for the Boulder Dam Project. The first attempt to gain congressional approval for construction of Boulder Dam came in 1922 with the introduction of two bills in the House of Representatives and the Senate. The bills were introduced by Congressman Phil D. Swing and Senator Hiram W. Johnson and were known as the Swing-Johnson bills. The bills failed to come up for a vote and were subsequently reintroduced several times. In December 1928, both the House and the Senate finally approved the bill and sent it to the president for approval. On December 21, 1928, President Calvin Coolidge signed the bill approving the Boulder Canyon Project. The initial appropriation for construction was made in July 1930, by which time Herbert Hoover had become President. Early plans called for the dam to be built in Boulder Canyon, so the project was known as the Boulder Canyon Project. The dam was actually built in Black Canyon, but the project was still called the Boulder Canyon Project. Very few companies could put up a $2 million bond required to bid on the contract. The contract to construct the dam was awarded to a consortium of Six Companies, Inc., a joint venture of Morrison-Knudsen Company of Boise, Idaho; Utah Construction Company of Ogden, Utah; Pacific Bridge Company of Portland, Oregon; Henry J. Kaiser & W. A. Bechtel Company of Oakland, California; McDonald & Kahn Ltd. of Los Angeles; and J. F. Shea Company of Portland, Oregon. Six Companies, Inc. was also contracted to build a new town for construction workers, to be called Boulder City, but the construction schedule for the dam was accelerated in order to create more jobs in response to the onset of the Great Depression, and the town was not ready when the first workers arrived at the site in early 1931. During the first summer of construction, workers and their families were housed in temporary camps in Ragtown while work on the town progressed. Discontent with harsh living conditions and dangerous working conditions led to a strike on August 8, 1931. Six Companies responded by sending in strike-breakers with guns and clubs, and the strike was soon quashed. But the discontent prompted the authorities to speed up the construction of Boulder City, and by the spring of 1932 Ragtown had been deserted . While working in the tunnels, many workers suffered from the carbon monoxide generated by the machinery there, including trucks that were driven in. The contractors claimed that the sickness was pneumonia and was not their responsibility. Some of the workers sickened and died in nearby hospitals because of the so-called "pneumonia." Those who died off the site were not counted on the official death list. Most workers were paid $4.00 per day and the "high-scalers" who risked their lives climbing on the high cliffs were paid $5.60 per day. These were good wages in the depression era. To isolate the construction site, and protect it from flooding, two cofferdams were constructed. To divert the river's flow around the construction site, four tunnels (called spillways) were driven through the canyon walls, two on the Nevada side and two on the Arizona side. These tunnels were 56 feet (17 m) in diameter. Their combined length was nearly 16,000 feet (4880 m, more than three miles). Tunneling began at the lower portals of the Nevada tunnels in May 1931. Shortly after, work began on two similar tunnels in the Arizona canyon wall. In March 1932, work began on lining the tunnels with concrete. First the base or invert was poured. Gantry cranes, running on rails through the entire tunnels were used to place the concrete. The sidewalls were poured next. Moveable sections of steel form were used for the sidewalls. Finally, using pneumatic guns, the overheads were filled in. The concrete lining is 3 feet (914 mm) thick, reducing the finished tunnel diameter to 50 feet (15 m). Construction of the upper cofferdam began in September 1932, even though the river had not yet been diverted. A temporary horseshoe-shaped dike protected the cofferdam on the Nevada side of the river. After the Arizona tunnels were completed, and the river diverted, the work was completed much faster. Once the cofferdams were in place and the construction site was dry, excavation for the dam foundation began. It was necessary to remove all loose material until solid rock was reached to provide a firm foundation for the dam. Work on the foundation excavations was completed in June 1933. During excavations for the foundation, approximately 1,500,000 yd³ (1,150,000 m³) of material was removed, including material that was the result of canyon wall stripping operations. The first concrete was placed into the dam on June 6, 1933. Since no structure the magnitude of Boulder Dam had ever been constructed, many of the procedures used in construction of the dam were untried. One of the problems that faced the designers was cooling and contraction of such large amounts of concrete in the dam. Rather than being a single block of concrete, the dam was built as a series of interlocking trapezoidal columns in order to allow the tremendous heat produced by the curing concrete to dissipate. Engineers calculated that if the dam were built in a single continuous pour, the concrete would have gotten so hot that it would have taken 125 years for the concrete to cool to ambient temperatures. The resulting stresses would have caused the dam to crack and crumble away. It was decided to pipe refrigerated water through tubes in the wet concrete to remove the heat generated by the chemical reactions that solidify the concrete. Such a large refrigeration project was beyond the expertise of Six Companies, Inc., and Union Carbide Corporation was contracted to assist with the refrigeration part of the project. In order to speed up the concrete cooling so that layer could be poured more quickly, each form contained cooling coils of 1 inch (25 mm) thin-walled steel pipe. When the concrete was poured, river water was circulated through these pipes. After an initial cooling, chilled water from a refrigeration plant on the lower cofferdam was circulated through the coils to finish the cooling. As each block was cooled, the pipes of the cooling coils were cut off and pressure grouted with pneumatic grout guns. Excavation for the powerhouse was carried out in conjunction with excavations for the dam foundation and abutments. Excavations for the U-shaped structure located at the downstream toe of the dam were completed in late 1933 with the first concrete placed in November 1933. Generators at the Dam's Hoover Powerplant began to transmit electricity from the Colorado River a distance of 266 miles (364 km) to Los Angeles, California on October 26, 1936. Additional generating units were added through 1961. Water flowing from Lake Mead through the gradually-narrowing penstocks to the powerhouse reaches a speed of about 65 miles per hour when it reaches the turbines. The seventeen main turbine-generator combinations at this powerhouse generate a maximum of 2,074 megawatts of hydroelectric power. All hydroelectric plants generate a controlled, variable amount of power as the demand for power varies during a day. In fact, a big advantage of hydroelectric power is the ability to quickly and readily vary the amount of power generated, depending on the load presented at that moment. Steam-driven power plants are not so easily "throttled" because of the amount of thermodynamic inertia contained in their systems. Even though water control, not power generation, is the main purpose of the dam, the dam construction and maintenance has been fully paid for through the sale of electricity from the dam. The initial plans for the finished facade of both the dam and the power plant consisted of a simple, unadorned wall of concrete topped with a Gothic-inspired balustrade and a powerhouse that looked like little more than an industrial warehouse. This initial design was considered too plain and unremarkable for a project of such immense scale, so Los Angeles-based architect Gordon B. Kaufmann was brought in to redesign the exteriors. Kaufmann greatly streamlined the buildings, and applied an elegant Art Deco style to the entire project, with sculptured turrets rising seamlessly from the dam face and clock faces on the intake towers set for Pacific and Mountain time zones. Hoover Dam today is considered one of the finest examples of Art Deco anywhere in the world. The Hoover Dam also serves as a crossing for U.S. Route 93. This will change by 2008 when the Mike O'Callaghan-Pat Tillman Memorial Bridge is completed as part of the Hoover Dam Bypass Project. The section of U.S. Route 93 that approaches and crosses Hoover Dam is woefully inadequate for the increased vehicle traffic of today. It is one lane in each direction, has several narrow and dangerous turns, has poor sight distances, pedestrian crossings, and an occasional rock slide. Following the September 11, 2001 terrorist attacks, truck traffic over the Hoover Dam has been diverted south to a Colorado River crossing near Laughlin, Nevada in an effort to safeguard the dam from hazardous spills or explosions. The bypass and the bridge are intended to improve travel times, replace the dangerous roadway, and reduce the threat of an attack or a potential accident at the dam site. Dam height: 726.4 ft (221.4 m), second highest dam in the United States. With 8 to 10 million visitors each year, including visitors to Hoover Dam but not all traffic across the dam, the Lake Mead National Recreation Area is the fifth busiest U.S. national park. The large spillway tunnel blasted into the Black Canyon walls for Hoover Dam has only been used twice in the history of the dam. Once was during a planned period in the second half of 1941, for testing the spillways, and the second one was for about six weeks during the summer of 1983, when a snow-melt flood in the Colorado River Basin made use of the spillways necessary. 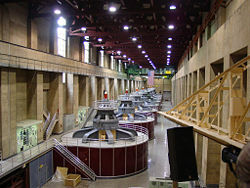 Usually all the flow of the Colorado River, other than that lost to evaporation in Lake Mead, passes through the water turbines of the Hoover Dam powerhouse. The dam, originally planned for a location in Boulder Canyon, was relocated to Black Canyon for better impoundment, but was still known as the Boulder Dam project. Work on the project started on July 7, 1930. At the official beginning of the project on September 17, 1930, President Hoover's Secretary of the Interior Ray L. Wilbur, announced that the new dam on the Colorado River would be named Hoover Dam to honor the man most responsible for its existence, who also by then was President. Woodrow Wilson and Calvin Coolidge already had dams named after them. Furthermore, Hoover was already campaigning for re-election in the face of the depression and sought the credit for creating jobs. A Congressional Act of February 14, 1931, made the name "Hoover Dam" official. When Roosevelt took office on March 4, 1933, he brought in Harold Ickes to replace Ray Lyman Wilbur as Secretary of the Interior. Ickes wasted no time removing Hoover’s name from the Boulder Canyon Project. On May 8, 1933, Ickes issued a memorandum to the Bureau of Reclamation, which was in charge of the dam, stating, "I have your reference to the text for the pamphlet descriptive of the Boulder Canyon Project for use at the Century of Progress Exposition. I would be glad if you will refer to the dam as 'Boulder Dam' in this pamphlet as well as in correspondence and other references to the dam as you may have occasion to make in the future." Ickes could not "officially" change the name of the dam, as that had been set by Congress, but the effect was the same: all reference to "Hoover" Dam vanished in favor of "Boulder" Dam. Official sources, as well as tourist and other promotional material referred to it as Boulder Dam. Roosevelt died in 1945 and Harold Ickes retired in 1946. On March 4, 1947, California Congressman Jack Anderson submitted House Resolution 140 to "restore" the name Hoover Dam. Anderson’s resolution passed the House on March 6; a companion resolution passed the Senate on April 23, and on April 30, 1947, President Harry S. Truman signed Public Law 43 which read: "Resolved…that the name of Hoover Dam is hereby restored to the dam on the Colorado River in Black Canyon constructed under the authority of the Boulder Canyon Project Act…. Any law, regulation, document, or record of the United States in which such dam is designated or referred to under the name of Boulder Dam shall be held to refer to such dam under and by the name of Hoover Dam." The hardhat was invented, and first used, by the construction workers of the Hoover Dam. The construction of the Hoover Dam project, controversies and Chief Engineer Frank Crowe's role were dramatized in a one-hour TV docu-drama, as part of the BBC's "Seven Wonders of The Industrial World" Series in 2003  available on DVD . The dam is sung about in The Highwaymen's "Highwayman" song. It tells the story of a fictional dam builder who fell in wet concrete during construction and died. Stevens, Joseph E. Hoover Dam: An American Adventure. University of Oklahoma Press, 1990. "Boulder Dam" – Part I and Parts III and IV, documentary films from the Prelinger Archives at the Internet Archive. This page was last modified on 13 January 2018, at 23:53.